For a person that can barely tell north from south, I sure can’t resist a pretty map. Old maps, cartoony tourist and amusement park maps, and fantasy novel maps - I could wallpaper a room with ones I've saved. My junior high U.S. history teacher made the entire class draw stacks of maps. She was exacting. Maps had to be the correct scale, labeled neatly, colored, and have all the right designations. A lot of people looked it as unfair torture. Me? I couldn’t believe this was homework. I loved sitting down with paper, freshly sharpened pencils, markers, and crayons. I took my time drawing rivers and printing names very tiny and nicely, and I always got high marks. Classmates accused me of brown-nosing, but really I liked replicating maps. It didn't have the teacher's desired effect; my geography skills are pitiful. But. I had fun. It's still my favorite part of worldbuilding for stories or campaigns. First the maps and then the food. I'm working on adding characters into that mix. I think one reason I find it so easy to fall into fantasy stories is because of the incredible maps that typically accompany them. What’s a world without a map to set destinations firmly in readers’ minds? I know that for some descriptions of the journey are enough, but I want to flip to the inside cover and follow the footsteps of my favorite character with my fingertip. It gives me a connection. I've started to keep a virtual collection of maps. My favorites haven't changed over the years. (You should really click to embiggen these images). Middle Earth - From the rose to the forests to the rolling names - I adore it all. It's probably cliche to choose this as my absolute favor, but I don't think anyone will blame me. 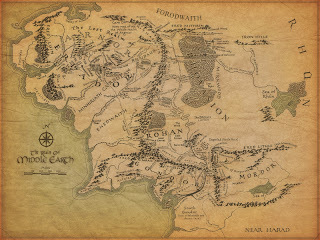 The geography of Middle Earth is crucial to the story. Readers should mark where the Fellowship travels, where they split, and all their different paths. I did this once by xeroxing a copy of the map from the books and using a different color for each character; I really wish I would have kept it. Other people do that, right? Right. Westeros - Before HBO created a fabulous title sequence for Game of Thrones (yes, it grew on me) featuring the land of the Seven Kingdoms, we had the paper maps to drool over. 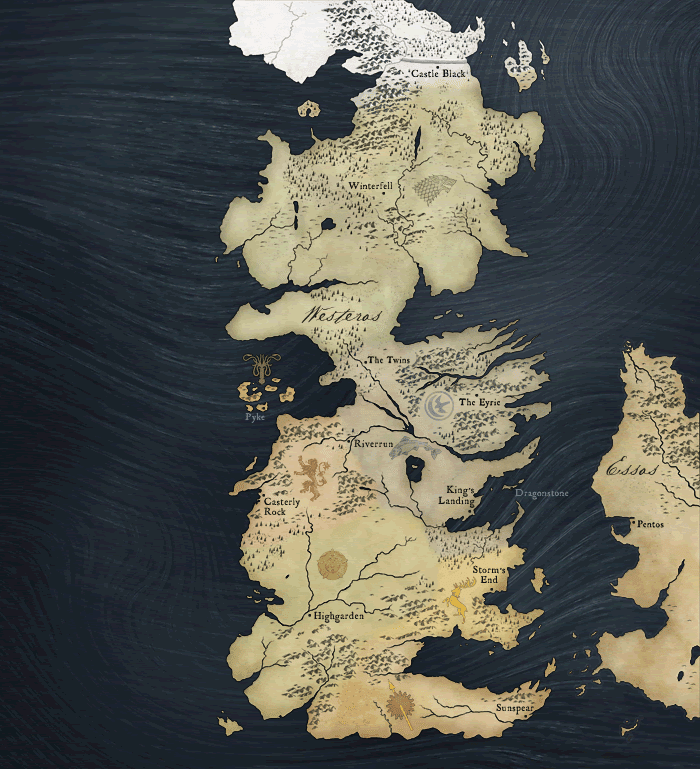 The series A Song of Ice and Fire is rich in every aspect, and the map doesn't disappoint. It is one of just a handful of fantasy novel maps I've seen that vary from the layout of Middle Earth above. Again in this world, characters fighting for the throne and the people that have to follow them move all over the map. I would never attempt to trace footsteps because there just isn't enough room. Geographic features, manmade or natural, are almost characters themselves. The Wall plays a big role, and the Narrow Sea is mentioned over and over. Randland - Unless it's happened in the last few books, I don't think the land where the Wheel of Time story takes place has an official name yet. Back in the days of the wotmania.com forums (I was a proud t-shirt owner), this sparked passionate conversations. Of course, most any topic did in those forums. Many fans, myself included, call it Randland. This map is a little overwhelmed with details but so is the series. It matches. I sometimes get it mixed up with Middle Earth, but I straighten myself out by remembering that in Randland, the Big Bad resides in the north. The piece I admire most on this map is the rose. It's woven with the series logo (for lack of a better word). Just lovely. What, no love for the classics? This is a great post. I have a 3'x5' map of Middle Earth next to my bed. I'm rather fond of Midkemia, myself. Have you considered using something see-through for tracing character movement in Westeros - like those overhead projector pages. Then you can mark a character's path on their own separate pages. Later, you can freely mix and match wich characters movements you want to see by placing more than one page over the map. Huh, and here I thought I was the weird one who kept maps of real and fictional places on my walls. Mapmaking is my favorite part about world-building too! Whenever it's my time to DM a game I always build my own maps because it's a treat to myself and hopefully if I do it well, a treat for the players as well. The Belgariad and the Malloreon! 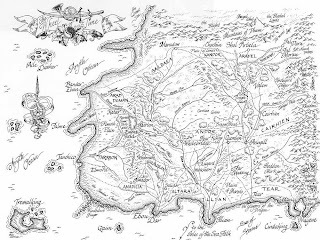 I started reading them when I was eleven and I knew, somehow, that I could NOT write any fantasy story that didn't have maps like David Eddings'. I had no idea at the time that nearly every fantasy author did it, but I've been drawing maps for my characters ever since. I would highly highly recommend buying The Atlas of Middle Earth. 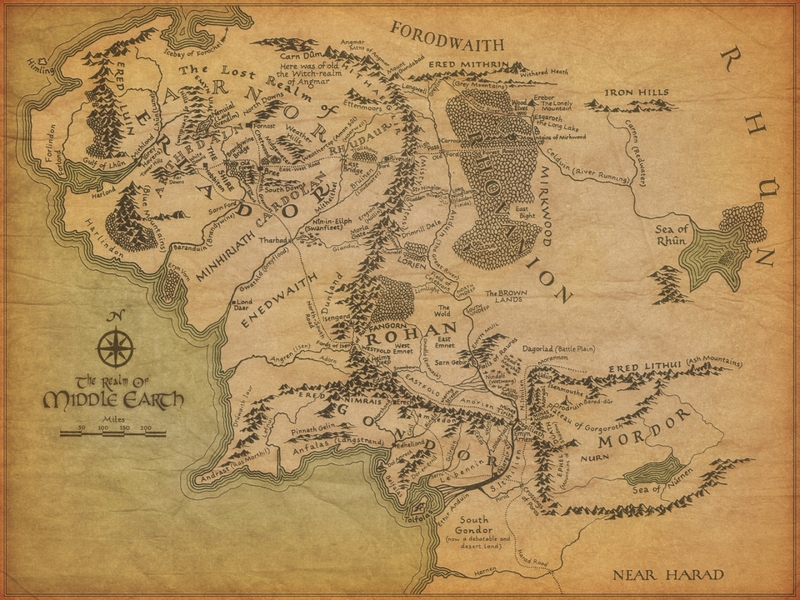 For a map geek and Tolkien geek, it is the best thing ever. There are sections for the First, Second, and Third Ages. There's everything from the migrations of the elves to Valinor to the Last Alliance to Lothlorien to the Battle of Bywater. Battles, houses, journeys, places - it's amazing. I drool over it regularly. I love maps! 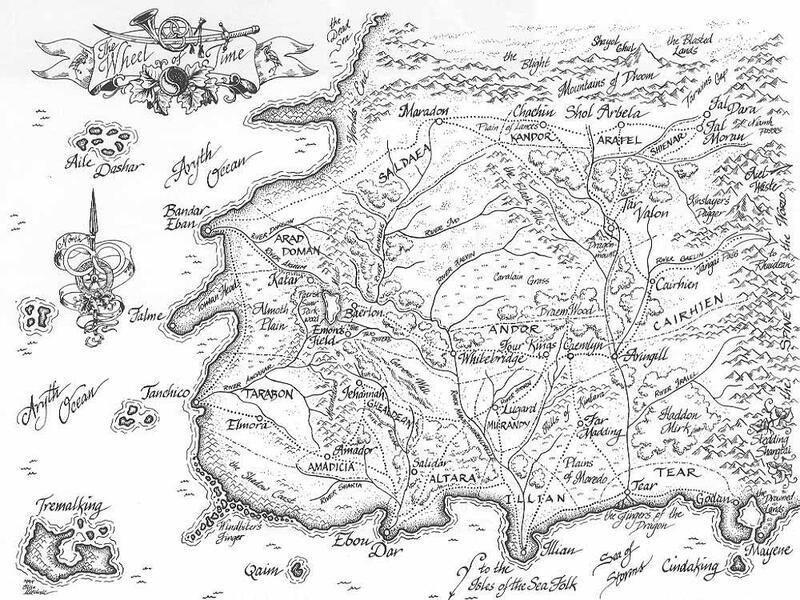 My first fantasy series were Redwall and then Shannara, and they always had maps. True story: I was introduced to Wheel of Time when my mother randomly gave it to me (she saw it at the store and thought I might like it). I wasn't sure about it at first (yes, I started to judge the book by its cover), but when I flipped through the first few pages, I thought to myself, "Well, at least it has a respectable map." Map = approval. I have a fantasy map on my wall! The collector's edition of Dragon Age: Origins came with a cloth map of Ferelden. I was disappointed Dragon Age 2 didn't come with a map of Kirkwall or the Free Marches. Oh well. My 14 year old daughter had a similar assignment this year. She asked her teacher if it had to be a map of a real place. He said no but the drawing had to be a more stylized and detailed than a regular map. She brought in the map of the city of Cauldron from the Shackled City D&D campaign and he was amazed at the map she was using and even more amazed when she drew city hall, the army barracks, the docks, and the "Meat (We generally say rat)on a Stick" stand we visited in our adventure. Needless to say she received an A+. such a nice guide. thanks for your time. columbus day weekend and also checkout columbus day a national holiday. you should showbox apk free download for android.